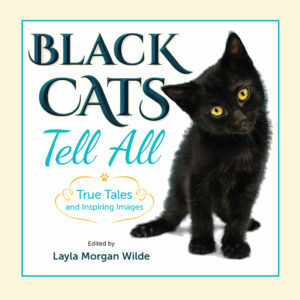 New nonprofit book signals the end of negative black cat stereotypes with the aim to boost shelter adoption rates. Celebrity cats are featured. (Hartsdale, NY) – Oct 11, 2017 – The odds of a black cat being adopted in a shelter are 50% less than any other color. The crazy reason stems from outdated superstitions linking black cats with evil witches and the devil. Every Halloween these stereotypes are reinforced. With Halloween spending projected to hit a record 9.1 billion this year, Layla and the black cats offer an opportunity to change perceptions. A black cat army of pawsitivity assembled by New York cat expert, Layla Morgan Wilde, includes celebrity cats Cole and Marmalade (the #1 cat video content producer); Tater from the #1 NatGeo show, The Incredible Dr. Pol; Snuckles, SF Giant’s baseball darling along with dozens of Instagram influencers from around the world will bring smiles and change minds one adoption at a time. They’ll even dress up in the silliest Halloween costumes to make their point: black cats are adorable and adoptable.Layla Morgan Wilde says,”I’ve seen black cats languish in shelters and euthanized more often simply because of the color of their fur. It so infuriated me, I was determined to root through the myths to find the truth and do something about it. We live in an era of fake news, and I feel a responsibility to cats and those who love them, to tell the truth. In fact, I traced back the source of black cat superstition to one pivotal event in 1233 that changed the course of history. Blurbs by several NY Times bestselling authors. ISBN:978-0-9980591-9-8 l Soft cover $19.99 – 8 X 8 in. For media inquiries and review copies, contact: Layla Morgan Wilde. Interviews with Layla and select feline contributors are available. All the feline photography at Cat Wisdom 101 is by Layla, an award-winning photographer who captures cats in natural poses and environments to provide further insights into their mysterious nature. 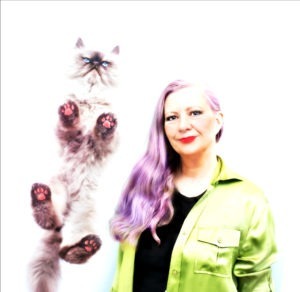 Layla Morgan Wilde is a professional member of the Cat Writers’ Association and a winner of the CWA Muse Medallion for photography in 2011, 2012, 2013 and recipient of certificates of excellence in writing , blogging and photography in 2011, 2012, 2013 and 2014. Layla Morgan Wilde founded the Canadian registered charity, The Annex Cat Rescue in 1997 to create a unique program of fostering and TNR. In 2016, she founded the 501 (c) 3 nonprofit Black Cats Tell All to raise awareness and adoption rates for black shelter cats.